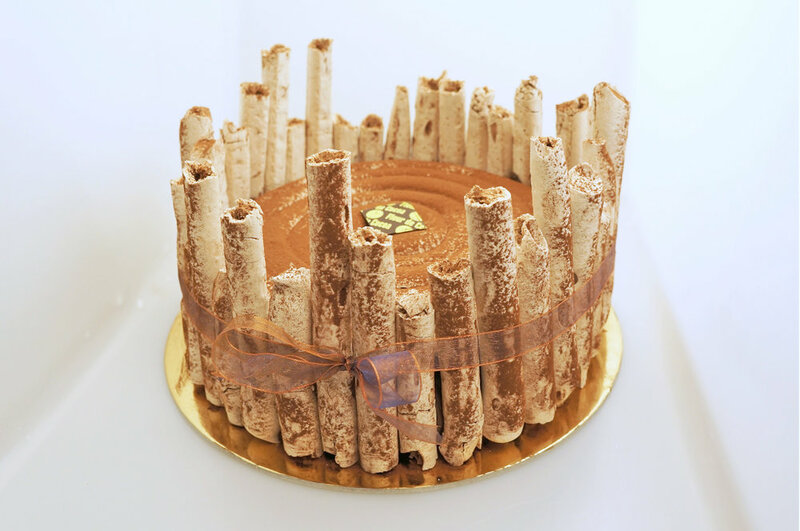 We make rich, traditional French mousse cakes from scratch, always using the finest ingredients available. Not all cakes are available at all times. We do have cakes available at our shop, however, we make cakes in small batches and some are seasonal. Please contact us in advance if you are looking for a specific cake. Dark chocolate mousse and chocolate sponge cake lightly soaked with Grand Marnier. Gluten-free. 15 - 60 serving sizes available via custom order at $5.00 / serving. Dark chocolate mousse with a crispy hazelnut praline layer and almond sponge cake. Our most popular cake. Dark chocolate raspberry mousse with raspberry coulis and chocolate sponge cake. Gluten-free. Our custom 70% dark chocolate mousse, chocolate sponge cake with cacao nibs and almond sponge cake. Gluten-free. White chocolate mousse with raspberry coulis. Topped with fresh raspberries and meringue. Gluten-free. Raspberry mousse, ladyfinger sponge cake, and lemon cream. Gluten-free. Also known as Napoleon. Made of layers of crispy puff pastry and rum pastry cream. Pistachio mousse, dark chocolate mousse and chocolate sponge cake. Gluten-free. Dark chocolate mousse with layers of meringue and a crisp meringue surround. (special order). Originlly created by famed pastry chef Gaston Lenotre in 1969 to honor the supersonic jet of the same name. Gluten-free. Dark chocolate mousse, caramelized bananas with rum and cinnamon, and dark chocolate sponge cake lightly soaked with Crème de Banane. Gluten-free. Ladyfinger sponge cake soaked with strawberry syrup, layered with vanilla Crème Madame and fresh strawberries (seasonal, special order). Gluten-free. Layers of creamy caramel mousse, dark chocolate mousse, almond sponge cake with pecan pieces, and chocolate sponge cake (special order). Gluten-free. Coffee butter cream, chocolate ganache, and almond sponge cake (special order). Gluten-free. Tahitian vanilla bean mousse with dark chocolate sponge cake. Gluten-free. Dark chocolate mousse with layers of meringue with a dark chocolate wrapping. (special order). Gluten-free. Puff pastry, vanilla bean Chantilly cream, vanilla pastry cream, and caramelized cream puffs (special order). A Marion blackberry dark chocolate mousse with dark chocolate sponge cake. Gluten-free. Dark chocolate mousse and chocolate sponge cake lightly soaked with Bulleit Bourbon. Gluten-free. The King’s Cake celebrates Epiphany; the coming of the Three Wise Men with gifts. Galette des Rois is a round cake of flaky puff pastry filled with frangipane, an almond cream. Passion fruit mousse, dark chocolate mousse, and chocolate sponge cake. Gluten-free.